Imagine no more tears when it comes to hair brushing. Anyone with unruly hair will know how painful brushing tangled hair can be. 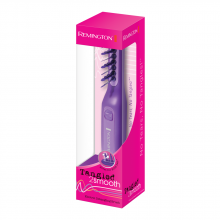 But with the Tangled 2 Smooth Electric Brush, detangling is quick and easy – and more importantly pain-free. 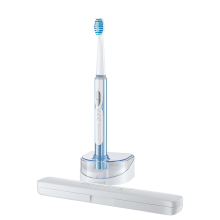 Also available in a stylish purple and perfect for children, gentle soft teeth on the brush head rock back and forward while you brush, gently loosening any knots and tangles, preventing any pull on your hair and protecting the scalp from harsh strokes, which can be extremely uncomfortable. If you suffer from difficult hair, you can rest assured that this is all you’ll need to make taming your hair quick and easy for your little ones. As simple to use as a traditional hair brush, it gently glides through any type of hair – you will be amazed how quickly your knots are smoothed out. 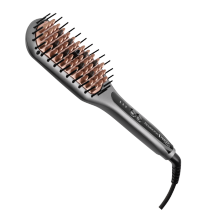 The cordless brush can be used on wet, damp or dry hair. Battery operated, with a protective cover included, it’s easy to take anywhere with you – ideal for when your hair is feeling untamed because of the weather, or to a swimming pool where changing room brushing would normally bring your little one to tears. Suitable for any hair type – smooth, sleek, tangle-free hair can be yours at last – and it couldn’t be easier. 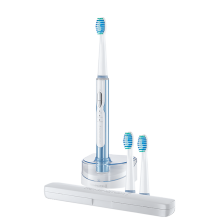 Special teeth on the brush move back and forward during brushing, to gently ease out any tangles or knots in the hair. Say no to tears and tangles*. Hair brushing can become a battleground for parents and children, but the Tangled 2 Smooth product makes it quick, easy and even fun for little ones.